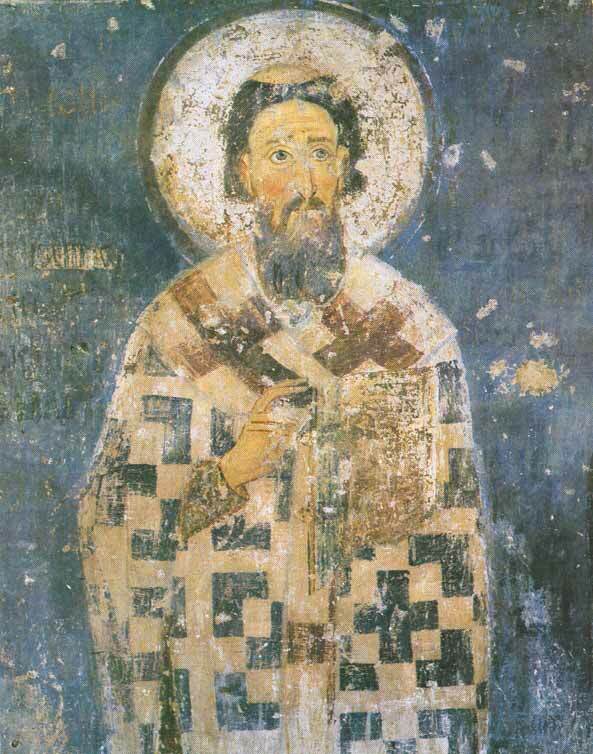 Saint Sava, First Archbishop of Serbia, in the world Rostislav (Rastko), was a son of the Serbian king Stephen Nemanya and Anna, daughter of the Byzantine Emperor Romanos. From his early years he fervently attended church services and had a special love for icons. Knowing that his son was on Athos, his father mobilized his retainers headed by a faithful voevod and wrote to the governor of the district which included Athos, saying that if his son were not returned to him, he would go to war against the Greeks. When they arrived at the monastery, the voevod was ordered not to take his eyes off Rostislav. During the evening services, when the soldiers had fallen asleep under the influence of wine, Rostislav received monastic tonsure (in 1186) and sent to his parents his worldly clothes, his hair and a letter. St Sava sought to persuade his powerful parents to accept monasticism. The monk's father (in monasticism Simeon, commemorated on February 13) and his son pursued asceticism at the Vatopaidi Monastery. On Athos they established the Serbian Hilandari Monastery, and this monastery received its name by imperial grant. At Hilandari Monastery, St Sava was ordained to the diaconate and then presbyter. His mother Anna became a nun with the name Anastasia (June 21). For his holy life and virtuous deeds on Mount Athos, the monk was made an archimandrite at Thessalonica. At Nicea in the year 1219 on the Feast of the Dormition of the Most Holy Theotokos, the Ecumenical Patriarch Germanus consecrated Archimandrite Sava as Archbishop of Serbia. The saint petitioned the Byzantine Emperor to grant permission for Serbian bishops to elect their own Archbishop in future. This was a very important consideration in a time of frequent wars between the eastern and western powers. Having returned to the Holy Mountain from Nicea, the saint visited all the monasteries for the last time. He made prostrations in all the churches and, calling to mind the blessed lives of the wilderness Fathers, he made his farewells to the ascetics with deep remorse, "leaving the Holy Mountain, as if from Paradise." Saddened by his separation from the Holy Mountain, the saint went along the path from Athos just barely moving. The Most Holy Theotokos spoke to the saint in a dream, "Having My Patronage, why do you remain sorrowful?" These words roused him from despondency, changing his sorrow into joy. In memory of this appearance, the saint commissioned large icons of the Savior and of the Mother of God at Thessalonica, and put them in a church. In Serbia, the activity of the Hierarch in organizing the work of his native Church was accompanied by numerous signs and miracles. During the Liturgy and the all-night Vigil, when the saint came to cense the grave of his father the monk Simeon, the holy relics exuded fragrant myrrh. Being in charge of negotiations with the Hungarian King Vladislav, who had declared war on Serbia, the holy bishop not only brought about the desired peace for his country, but he also brought the Hungarian monarch to Orthodoxy. Thus he facilitated the start of the historical existence of the autonomous Serbian Church, St Sava contributed also to strengthening the Serbian state. In order to insure the independence of the Serbian state, Archbishop Sava crowned his powerful brother Stephen as king. Upon the death of Stephen, his eldest son Radislav was crowned king, and St Sava set off to the Holy Land "to worship at the holy tomb of Christ and fearsome Golgotha." When he returned to his native land, the saint blessed and crowned Vladislav as king. To further strengthen the Serbian throne, he betrothed him to the daughter of the Bulgarian prince Asan. The holy hierarch visited churches all across Serbia, he reformed monastic rules on the model of Athos and Palestine, and he established and consecrated many churches, strengthening the Orthodox in their faith. Having finished his work in his native land, the saint appointed the hieromonk Arsenius as his successor, consecrating him bishop and giving his blessing to all. He then set off on a journey of no return, desiring "to end his days as a wanderer in a foreign land." He passed through Palestine, Syria and Persia, Babylon, Egypt and Anatolia, everywhere visiting the holy places, conversing with great ascetics, and collecting the holy relics of saints. The saint finished his wanderings at Trnovo in Bulgaria at the home of his kinsman Asan, where with spiritual joy he gave up his soul to the Lord (+ 1237). At the time of transfer of the holy relics of St Sava to Serbia in 1237, there were so many healings that the Bulgarians began to complain about Asan, "because he had given up such a treasure." In the saint's own country, his venerable relics were placed in the Church of Mileshevo, bestowing healing on all who approached with faith. The inhabitants of Trnovo continued to receive healing from the remnants of the saint's coffin, which Asan ordered to be gathered together and placed in a newly built sarcophagus. The legacy of St Sava lives on in the Orthodox Church traditions of the Slavic nations. He is associated with the introduction of the Jerusalem Typikon as the basis for Slavic Monastic Rules. The Serbian Hilandari Monastery on Mt. 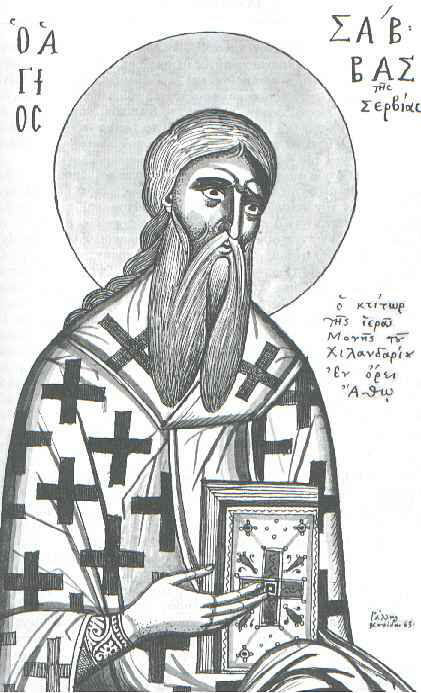 Athos lives by the Typikon of St Sava to this day. Editions of The Rudder (a collection of church canons) of St Sava, with commentary by Alexis Aristines, are the most widely disseminated in the Russian Church. In 1270 the first copy of The Rudder of St Sava was sent from Bulgaria to Metropolitan Cyril of Kiev. From this was copied one of the most ancient of the Russian Rudders, the Ryazan Rudder of 1284. It in turn was the source for a printed Rudder published in 1653, and since that time often reprinted by the Russian Church. 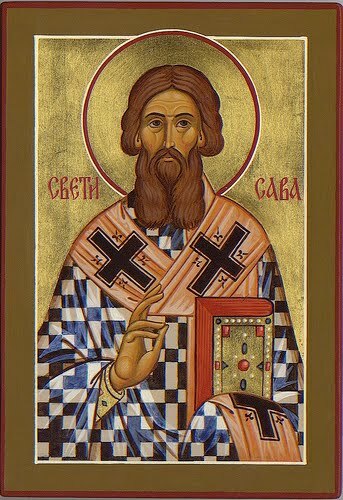 Such was the legacy of St Sava to the canonical treasury of Orthodoxy. O guide of Orthodoxy and blessed teacher of virtues, purifier and enlightener of thy homeland, beauty of monastics, most wise Father, Holy Sava, by thy teaching thou didst enlighten thy people, O flute of the Spirit, pray to Christ God for our souls. As the first great hierarch and co-worker with the Apostles, the Church of thy people magnifies thee; and since thou hast found favor with Christ, save us by thy prayers from every calamity, so that we may proclaim to thee: Rejoice, God-wise Father Sava.